Pure Live Pollen by the Pound! Bee Pollen, Propolis, and Royal Jelly. The honey bee is the only real source. Bee products are widely distributed through out the world in the form of tablets, tinctures, liquids, powders, and pastes. Many "bee products" are very profitable because they use a small portion of the natural resource in combination with other substances to create an "extract" or "supplement" or "nutritional combination." We don't. We sell the real thing! Real 100% pure live Pollen. The highest quality we can find in the world. 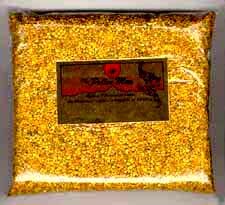 A Pound of Pure Pollen! . . . From Northern Yukon wildflowers. The nutritional equivalent of THOUSANDS of "supplement" pills. LIVE POLLEN! -- never freeze-dried, or reprocessed. Pollen is called "THE WORLD'S FIRST HEALTH FOOD" because its healing powers were first described in ancient writings, and a "SUPERFOOD" because pollen contains nearly every known nutrient required for a balanced human diet: 22 amino acids, 27 minerals, most of the known vitamins, and many enzymes. It is 35% protein, 40% carbohydrate, and 5% fat. It lacks only roughage and water for totally complete and balanced human health and nutrition. Call 503-254-5968 or Click Here to learn more about what Pollen can do for you. Royal Jelly . . . The pure form Queen bees would be eating if you weren't. Propolis is a sticky substance collected from the leaf buds of trees which secrete it to protect and promote new growth. Bees use it to seal and protect the hive because it contains natural antibiotics and is antibacterial. Away from the tree, it hardens, so we have to soak it in alcohol to create a form useable for humans. Our propolis is 65% pure propolis and 35% 10 Grain Alcohol. The Echinacea we use contains both strains. Hippocrates, the father of medicine, used a propolis salve in 400 BC to treat wounds. Propolis contains 500 times the bioflavoniod concentration of oranges. Its is antibiotic, antibacterial, and is known for its ability to stimulate human thymus activity and human immune systems. Call 503-254-5968 or Click Here to learn more about what Propolis can do for you.